At RAMPCO, we offer a selection of high-grade aluminium loading ramps in a wide range of sizes and styles. 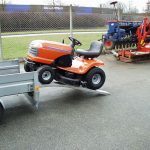 Our excellent value garden equipment ramps are designed to help you safely load garden tractors, ride-on lawn mowers and other garden apparatus into storage facilities or onto a truck or trailer for transportation. Garden and landscaping equipment ramps are an excellent investment for professional landscapers, ground maintenance companies and small gardening businesses. They can also be an ideal choice for homeowners who need to safely manoeuvre garden equipment into a garage or shed. Using a ramp for garden machinery is non-negotiable when equipment is too heavy to handle safely. Not only does lifting bulky equipment pose a risk of musculoskeletal injury to those attempting to move it, it could also end with damaged equipment and wasted working hours. At RAMCPO, we pride ourselves on assuring the highest standards of safety and compliance for our customers. All our ramps are fully certified and tested to EU standards, ensuring their reliability use after use. We also use DEKRA and TUV certifications for your peace of mind. All our ramps are compatible with connection accessories and attachments, so they can be securely and safely fitted.